Aki Maeda, Yu Kashii, Shiori Sekine, and Bae Doo-Na. The Skinny: With time running out, a newly-formed all-girl rock band must learn a few new songs before their big debut in Linda Linda Linda, a remarkably understated "feel-good" movie like no other. The film's iffy pacing and less obviously commercial sensibilities may confuse viewers expecting a more conventional underdog story, but ultimately, Linda Linda Linda packs quite a few surprises, including a great performance by Korean actress by Bae Doo-Na and undeniably rousing climax. Review by Calvin McMillin: The plot for Linda Linda Linda probably brings to mind any number of expectations, as the film revolves around an all-girl rock band who have only three days to prepare for a big gig at the annual school festival. Truth be told, we've all seen this type of movie before, or at least, that's what one might think initially. But the funny thing is, aside from the big performance at the end of the movie, Linda Linda Linda doesn't exactly play out like your average movie about musical underdogs. The point of the movie isn't about "getting discovered" or "making it big." The girls aren't even trying to win a talent contest - heck, there isn't a prize at stake to begin with. All these four gals are really trying to do is learn how to play a couple songs competently so they won't fall flat on their face when they perform in front of their peers. Couple that with the film's remarkably understated tone and a snail's pace approach to storytelling, and you might have a recipe for disaster. But thanks to some great performances and a cheer-inducing finale, what results from that odd mix of elements is perhaps the least manipulative "feel good" movie to come around in a very long time. Linda Linda Linda's story goes something like this: a high school rock band loses one of its guitarists when she injures her hand. They also lose their singer, who apparently had a falling out with Kei (Yu Kashii, from Until the Lights Come Back), the keyboard player-turned lead guitarist of the group. Drummer Kyoko (Battle Royale's Aki Maeda) and bassist Nozomi (Shiori Sekine) are the only two members remaining besides Kei, and none of them want to take on the role of lead vocalist. Desperate to find someone to fill the open position, they resolve to take the next person who passes by. After disqualifying the first few people they see, the girls eventually choose Son (Bae Doo-Na), an eager Korean exchange student at their school. It's an odd, if inspired choice, considering that Son's Japanese language skills could use some serious polishing. For some reason, that's simply not an issue. After perusing some old cassette tapes, they decide to perform a few hits by the famous Japanese punk band, the Blue Hearts: "The Song That Never Ends" and, of course, "Linda, Linda." With their track list chosen, now all these four would-be rockers have to do is practice day and night for the next seventy-two hours in order to learn the songs properly. And learn them, they do - but not without encountering a number of obstacles along the way. 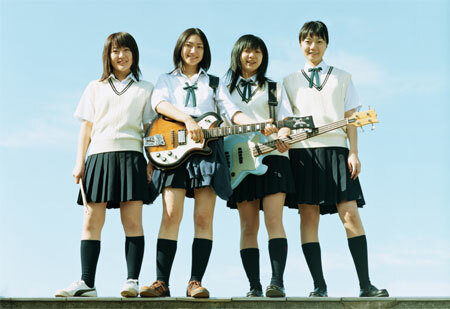 For some, the very idea of an all-girl rock band will conjure to mind expectations of a cutesy Japanese take on Josie and the Pussycats (perhaps complete with sailor uniforms), but Linda Linda Linda isn't exactly Morning Musume with guitars. In fact, none of the band members are made up to look like J-Pop idols in the least. While each actress is perhaps attractive in her own way, their overall appearances are drastically downplayed, as they all look a bit bland and otherwise ordinary - y'know, like regular high school students. And that real world approach to the material does in fact help create an immediately believable high school environment. While many of the girls in the band have boys they like (or boys that like them), none of these potential romances unfolds in a way that remotely resembles a conventional teen movie. Linda Linda Linda accurately captures the sheer awkwardness of high school crushes, as they often go unresolved or not at all like one had planned. Speaking of plans, if you're expecting a rousing underdog story all the way through - a sort of Rocky or Karate Kid in rock band form - Linda, Linda, Linda isn't that type of movie. In fact, the film is so understated that it's damn near comatose at times. As mentioned in the beginning of the review, there isn't a contest or a recording contract at stake. And in terms of conflict, there really are no "bad guys" in the film, no belligerent rival band that the girls have to overcome in order to achieve their dreams. Without those conventional beats, the film may prove to be a test of patience. It's all about practicing music and the incidental moments in life that can be amusing, heartbreaking, or life-affirming. In fact, the sort of easy-going storytelling mode lulls you into thinking you're just an eavesdropper, not someone truly along for the ride. But the amazing thing is you don't actually realize how invested you are in the characters until that climactic scene finally hits.  A full soundtrack for Linda Linda Linda was released as well as a single, "We are Paran Maum"
 While the Region 1 Viz Pictures DVD is the first available release bearing English subtitles, the subtitles themselves possess an annoying flaw. The subtitles never clarify if characters are speaking Japanese or Korean, instead translating everything into straight English. The result is that some of the language-based gags may lose audience members who can't tell spoken Japanese and spoken Korean apart.